Here is everything you need to know about how to vote, but were afraid to ask. Easy answers to hard questions about the election. On the right hand side under Voting Process click on Where do I vote? Bring ID that proves your name and address to that location on Monday October 19, 2015 between 8:00AM - 8:00PM. Bring ID that proves your name and address to that location on one of the days listed above. + When do I vote? Vote at an Elections Canada Office: During opening hours between now and October 13, 2015 you can vote in person at an Elections Canada office close to you. Enter your postal code, you will be redirected to your Electoral District page. On the right side of the page under Elector Information click on Where is my local Elections Canada Office? 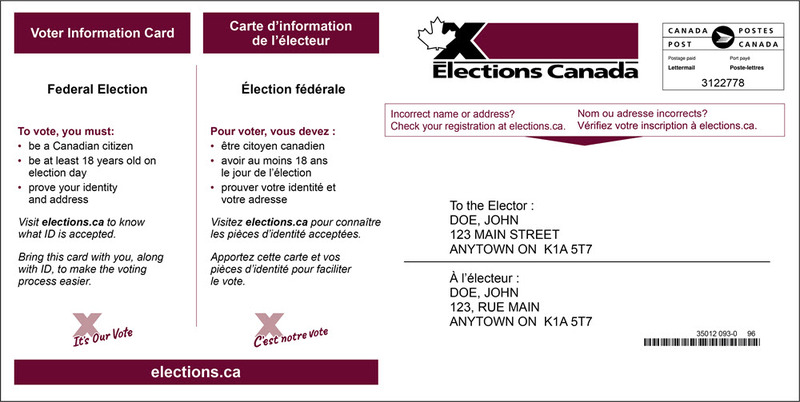 Go in person to your Elections Canada office, provide ID that proves your name and address. Vote by Mail: Will you be away or too busy? No problem you can vote by mail anytime before October 13, 2015. You will vote at a polling station, often a school or community center close to where you live. It's easy to find out where to vote. Bring ID that proves your name and address to that location. Find your polling station from your Voter-Information-Card: If you are registered with Electioins Canada then you will be sent a Voter-Information-Card in the mail before October 1, 2015. Your Voter-Information-Card will tell you when and where to vote. + Am I eligible to vote? 18 years old or older on October 19, 2015. Able to prove your name and address. + Am I registered to vote? Registering with Elections Canada will make your voting experience easier. If you are not registered you can still vote. When you show up to vote you will be registered in person at your polling station. You will need ID that proves your name and address. See “What ID do I need to vote?” section for more info. + How do I register to vote? + What ID do I need to vote? To vote you need to prove your your name and current address. 2) Show TWO pieces of ID. Both pieces of ID must have your name one must have your current address. You can display e-statements as ID on your phone or mobile device. 3) Take an Oath. If your ID does not have your current address. Show two pieces of ID with your name and have someone who knows you take an oath to prove your address. The person who takes the oath must prove their name and address. The person who takes the oath must be registered in your polling division. Each individual can only take one oath. + I missed the deadline to register? If you are not registered you can still vote. When you show up to vote you will be registered in person at your polling station. You will need ID that proves your name and address. See What ID do I need to vote? section for more info. + What if I’m working on Election Day? If you’re working on Election Day, your employer must allow you to have 3 consecutive hours off work while polls are open. Your employer only has to give you 3 hours off while the polls are open. So, if you normally work from 9:00AM to 5:00PM, you will NOT get any time off, because you still have 3 consecutive hours after work while the polls are open (5:00PM to 8:00PM). If you do get time off from work hours to vote, you have the right to get paid for those hours. + What if I am away on Election Day (ex: living abroad)? Vote By Mail: Will you be away or too busy on Election Day? No problem you can vote by mail at any time before October 13, 2015. Apply for a Mail in Ballot as soon as possible. + What if I'm studying away from home? You must first decide if you will vote in your home riding (where you lived before moving for your studies) OR the riding at which you now reside (your new address). Once you have decided where you want to vote you must make sure you are registered. Make sure that your ID matches where you want to vote. Enter your postal code you will be redirected to your Electoral District page. Vote by Mail: Are you living away from home but still want to vote in your home riding? No problem you can vote by mail at any time before October 13, 2015. + What if I recently changed addresses? If you recently moved within Canada you must change where you are registered. + What if I'm currently without an address? You live on a First Nations reserve or in an Inuit hamlet but have no address. You are a student living on campus but have no address. You live in a seniors' residence, long-term care facility or shelter. You live on the streets, but use the services of a shelter or soup kitchen. You will need a representative (administrator or person in charge) to sign a Letter of Confirmation of Residence for you. The Letter of Confirmation of Residence counts as ONE piece of ID that proves only your address. If you are unable to down load or print a Letter of Confirmatioin of Residence, Elections Canada will also accept a letter from the administrator that is printed on the letterhead of the establishment. When you go to vote, bring your letter and a second piece of ID with your name on it. Show TWO pieces of ID with your name and have someone who knows you attest to your address. The person who gives the oath must show proove their name and address. The person who gives the oath must be registered in the same polling division as you. The person who gives the oath can only offer an oath for one person.